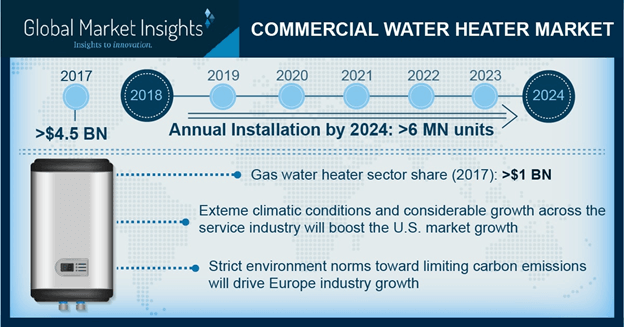 Commercial Water Heater Market size will surpass USD 7 billion by 2024, as reported in the latest study by Global Market Insights, Inc. Ongoing investment by respective government authorities toward development of smart cities will stimulate the global market. Growing demand for hot water primarily across hotels and office buildings coupled with rapid adoption of advanced technologies will enhance the business outlook. In 2017, the government of Canada has introduced ecoENERGY program which provide incentives for the deployment of efficient heating systems across educational institutes and other commercial establishments. Eminent participants across the global market include A.O Smith, Rinnai Corporation, Bradford White, Bosch Thermotechnology, Ferroli, Rheem, State Industries, Saudi Ceramics, Haier, Jaquar, Hubbell, Ariston Thermo, Vaillant, Whirlpool, Kanch Water Heaters and Viessmann.